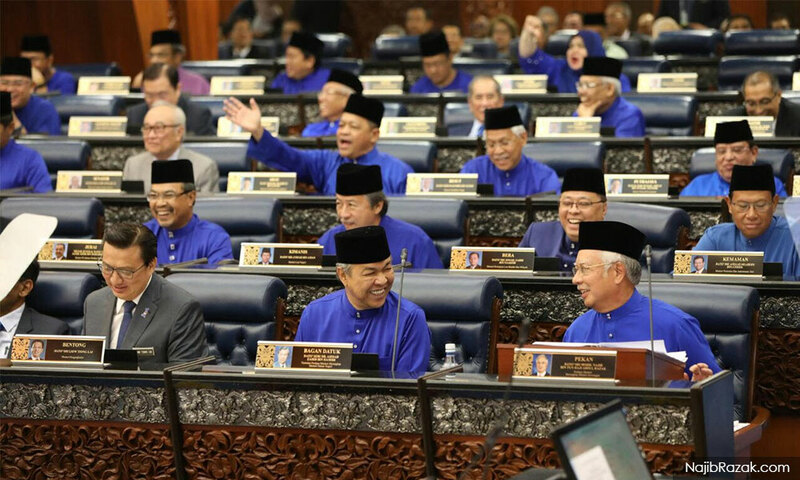 Prime Minister Najib Abdul Razak, who took several potshots at the opposition during the wrap up of his Budget 2018 speech, also had a message for his ministers and BN leaders. He impressed upon them the need for them to be loyal to him. Najib then cited the example of Ahmad Zahid Hamidi, who he described as “much more than” just a deputy prime minister. “I am lucky because I have, not only a deputy prime minister, but much more than that – a loyal friend, Ahmad Zahid Hamidi. “It is of utmost importance that members of the cabinet, component party leaders give me undivided loyalty and support in commandeering this ship we call Malaysia,” he said. Najib said they needed to carefully strategise moving forward. He also urged them not to waver in the face of their opponents. “Swear it, that even if your hands are severed from your body or your legs are paralysed, we will hold on to the responsibility and hopes entrusted by the people to us and will never sell them out to our opponents,” he said. Najib added that grit is necessary to propel BN to victory in the 14th general election. Met later, Zahid said he was overwhelmed with the recognition accorded to him by the prime minister. “It is the head of government’s appreciation of his deputy. His old friends who are with him will feel appreciated,” he added.